63 old lady Rheumatoid and hypertensive underwent Left Total knee replacement in October 2003 . 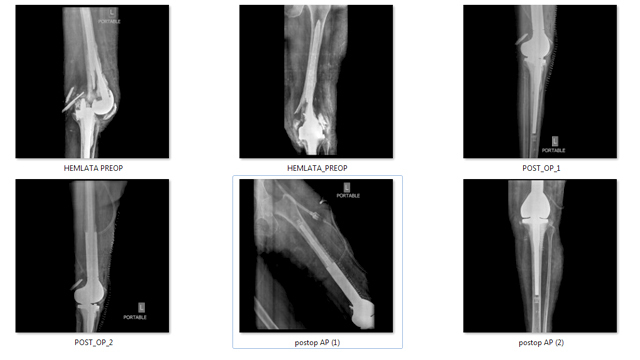 One month later she sustained fracture supracondylar femur which was managed by open reduction and plating. She presented to us 2 year later with non union of the fracture and broken plate . Broken implant was removed and expandable supracondylar nailing was done . 5 yr later the nail broke and revision TKR was done. Now the patient presented to us with fracture supracondylar femur with broken implant and dislocated knee. Previously these patients remain bedridden as no further surgery could be done but with the development of better surgical skills and implants (Mega Prosthesis) we were able to operate this patient and make her mobile once again.